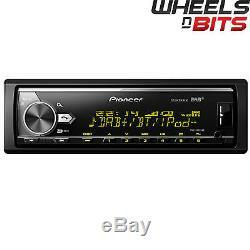 Pioneer MVH-X580DAB Car Stereo USB iPod iPhone DAB Radio Bluetooth ipod iphone. Connects to Apple iOS & Android devices. Everything you could wish for. This all-new, top of the line device sets new standards in terms of audio performance and connectivity. Nevertheless, its very easy to use and control. The MVH-X580DAB comes with a DAB/DAB+ tuner, so you can enjoy crystal-clear digital audio and interference-free reception. Its even equipped with a Time Shift function, which allows you to rewind, pause and resume live DAB transmissions. The unit reads FLAC files and has an on-board 4 x 50 Watts MOSFET amplifier, so youll enjoy top-notch sound, whatever the source youre playing. And if youre into a DJ-style listening experience, you can fire up the MIXTRAX function, which transforms your music into a DJ mix with illumination effects. The advanced Bluetooth electronics let you make hands-free calls with Wide Band Speech technology, so youll enjoy a much better sound quality during conversations. You can also stream music wirelessly from your Apple iOS or Android smartphone. Whats more, the MVH-X580DAB lets you connect two Bluetooth phones simultaneously, so you can keep both your private and business phones connected. MIXTRAX MIXTRAX keeps the party going with a non-stop mix of your music library complete with a range of DJ-inspired effects and club-style illumination. USB Input connect any device with an USB interface cable to charge your device or listen to clean, clear sound. Compatible with Android connect and listen to music stored on your device without the need for an app. DAB+enjoy the convenience of listening to your favourite radio stations in crystal clear digital quality. Works with iPod / iPhoneWith iPod and iPhone Direct Control, you can manage your i-device directly from your car dashboard and enjoy superior sound. Display Illumination match the display and key illumination to your vehicle's interior lighting with a range of over 210.000 colours and endless colour combinations. Digital Radio Tick Mark Approved product. In order to be granted use of the tick mark, manufacturers must meet the minimum specification, verified by independent testing. FLAC enjoy FLAC lossless digital audio files in your vehicle with playback output at CD quality, without the need to convert. Bluetooth maximise connectivity for hands-free calling and easy wireless audio streaming. Maximum power inputMOSFET 50W x 4. Button IlluminationZone based RGB Colour Customisation (210,000 Colours). DAB/DAB+ Digital Radio Tuner Optional antenna CA-AN-DAB. MP3, WMA, WAV, FLAC and AAC audio files. Other music devices via the front Aux-In. Accessories Protective Case for Front Panel. Additional Bluetooth Features 2 Phones Full Time Connection. Works with iPod / iPhone. Display IlluminationWide angle VA LCD Display (1.5 lines, DOT-matrix). DAB/DAB+ Functions Time Shift function. RCA Pre-Outs3 (Front, Rear, Subwoofer). The item "Pioneer MVH-X580DAB Car Stereo USB iPod iPhone DAB Radio Bluetooth ipod iphone" is in sale since Tuesday, July 12, 2016. This item is in the category "Vehicle Parts & Accessories\GPS, Audio & In-Car Technology\Car Stereos/Head Units". The seller is "wheelsnbitsltd" and is located in Omagh, Tyrone. This item can be shipped worldwide.